We Want YOUR True Ghost Stories! We want to hear your true ghost stories! In fact, we want to read them live on our radio show! 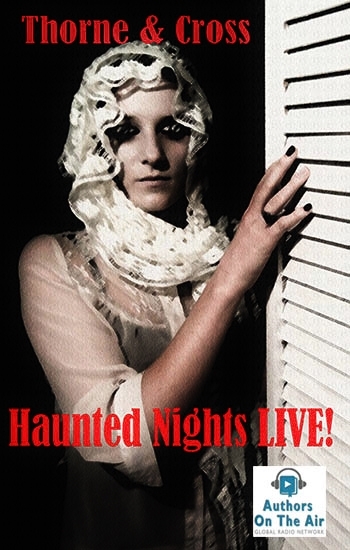 At Thorne & Cross: Haunted Nights LIVE! we’re adding a new level of spookiness by beginning each show with a true ghost story. Please read the requirements below and submit your true ghost story to HauntedNightsLive@gmail.com. Stories submitted MUST be sent to this email address for consideration. We’re looking forward to hearing from you. Stories may be from 300 to 1000 words in length. Stories need to be ready for us to read on the air; please do your own editing and proofreading. We will not consider stories that require rewriting. Do not post your stories on Facebook, or send them in private messages. They MUST be emailed to HauntedNightsLive@gmail.com to be considered. Thorne & Cross: Haunted Nights LIVE! © 2014-2015 • All rights reserved. No listener stories read by Thorne & Cross on Haunted Nights LIVE! can be reproduced in any way without written consent. By submitting material to the show, you guarantee there is no infringement on copyright laws, and that no person(s) will be harmed in any way. By submitting material to Thorne & Cross: Haunted Nights LIVE! you permit Thorne & Cross to use the submitted material in any way. There will be no compensation (monetary or otherwise) for use of submitted material to Thorne & Cross: Haunted Nights LIVE! Thorne & Cross: Haunted Nights LIVE! takes no responsibility for damages incurred by material submitted. Thorne & Cross: Haunted Nights LIVE! reserves the right to deny use of or alter any submitted material.